Right lumbar scoliosis. Permission Joseph E. Muscolino. Effective clinical orthopedic manual therapy must address the cause of the client’s condition. This means that we need to understand the mechanism that creates the problem. When a client presents with a scoliosis, we certainly should work in the region of the scoliosis because the scoliosis itself is a postural distortion pattern that creates bony and soft tissue stress factors. The musculature in the concavity of the scoliotic curve is locked short and the musculature on the convex side is locked long. Further, the concave side to which the spine is laterally flexing has compression forces on the joints and tension pulling forces occur on the convex side. For these reasons, manual therapy can and should be oriented to the soft tissues affected by the scoliotic curve. However, if the root cause of the scoliosis is not determined and addressed, then long term improvement is not possible. Therefore, it is necessary for the therapist to determine the mechanism that is causing the scoliosis. Some scolioses are described as “idiopathic.” The term idiopathic means that the cause is unknown (“idio” as in the word “idiot” refers to not knowing; “pathic” refers to the pathologic condition). Other scolioses are direct causes of local muscular imbalances. 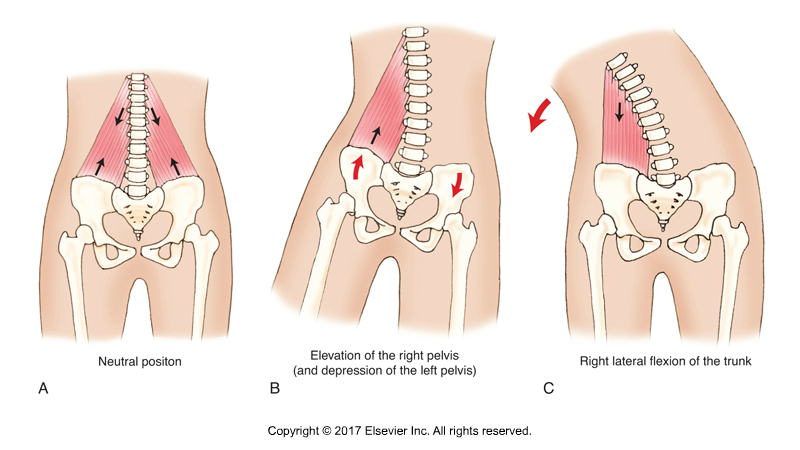 For example, a tight quadratus lumborum (QL) can cause a scoliosis of the lumbar spine; the concavity of the scoliotic curve present on the side of the tight QL. Other scolioses are also caused by asymmetric postural distortion patterns elsewhere in the body, usually in the lower extremity. Any pathomechanics that results in an unlevel posture of the pelvis in the frontal (coronal) plane can result in a scoliosis as a compensation. If the pelvis drops in the frontal plane on one side, then if the spine were straight, it would lean over to that side, like the Leaning Tower of Pisa. This would result in the head being unlevel. An unlevel head results in the eyes and inner ears being unlevel, which makes it very hard for the nervous system to determine our posture in space, in other words, proprioception becomes compromised. What Can Drop the Pelvis? Palpation of the gluteus medius. Permission Joseph E. Muscolino. The Muscle and Bone Palpation Manual – with Trigger Points, Referral Patterns, and Stretching, 2nd ed. (Elsevier, 2016). This should not be interpreted to mean that a scoliosis is always caused by muscular imbalances across the hip joint. However, it is one possible cause and shoulder therefore be assessed. For this reason, when the client presents with a lumbar scoliosis, one of the assessment steps should always be to palpate the hip joint musculature. For example, if the client has a right lumbar scoliosis (convexity to the right; a scoliosis is always named for the side of convexity), we need to assess if the abductor musculature on that side and/or the adductor musculature on the other side is/are tight (tighter than the opposite-side abductor and same-side adductor musculature). If either of these two groups are tight, then they should be treated to see if this helps improve the scoliotic curve. Of course, it also possible that these muscle groups might be tighter, not because they were primary, causing the scoliosis; but rather because they adaptively tightened as a result of the scoliosis. In other words, the scoliosis was relatively primary and the right hip joint musculature is secondary. The bigger picture here is that effective treatment of any musculoskeletal (neuro-myo-fascio-skeletal) condition requires treating the cause of the problem. This requires a thorough physical examination assessment of all the possible causes. In the case of a scoliosis, one possible cause is tight musculature of the hip joint in the frontal plane.